Of all the gardens in the close… you had to walk into mine!! Where did they come from and where did they go? Do you think if we disguise ourselves as a hedge, anyone will notice? The milkmans delivery was very fresh. When she asked for a manure delivery for the garden, this wasn’t exactly what she had in mind. 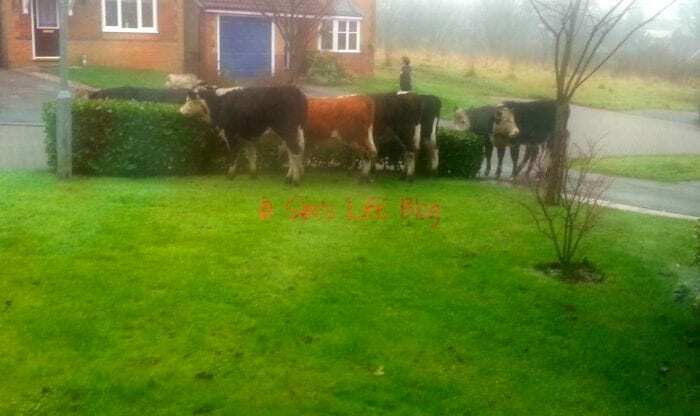 When Simone heard there were a gang of beefcakes in her front garden she was very excited….then she saw them! If you invite us in for a cup of tea, we’ll stop eating the hedge. We are close boys. Lets get our milk back! quick stand really still..she might not notice..think hedge!